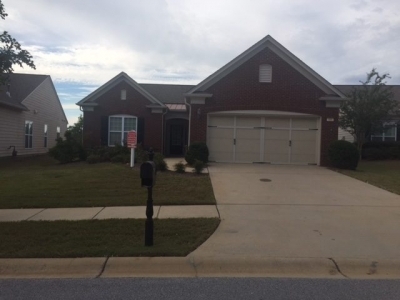 This is a brick-front ranch style home with an open floor plan. Hardwood floors throughout the living room, dining room and kitchen and features 2 bedrooms, 2 baths, an office, kitchen with granite counter tops and stainless steel appliances, laundry room with sink. The home has an enclosed sunroom and is freshly painted inside. It is the Copper Ridge floor plan. The 2-car garage is extended for golf cart and has epoxy flooring. The yard has a sprinkler system. Available for touring on November 19, 2016. Available for moving in December 1, 2016.